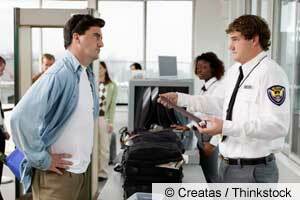 The Transportation Security Administration (TSA) claims that backscatter scans are safe. But how do medical professionals personally feel about it? Many doctors don’t opt out of the scans. Dr. Drew Pinsky calls the amount of radiation “inconsequential.” However, some researchers question whether the manufacturers’ measurements are valid — the exposure to radiation may actually be 10 times more than what the manufacturers claim. And Dr. Otis Brawley, chief medical officer of the American Cancer Society, takes a pat-down instead of going through a scanner when he travels. Brawley’s deputy, Dr. Len Lichtenfeld, has the same opinion. The issues associated with the use of so-called “naked body scanners” at airport security checks across the US and other countries have not let up, although most mainstream media have dropped the topic. Although these privacy violations are indeed troublesome, from my perspective as a physician, the issue of whether or not the “backscatter” scanners (which use ionizing radiation) are in fact safe takes precedence. And there are still gaping holes where solid scientific data should be. Safety Studies Still Lacking… Why? “[T]he airport scanners penetrate to about skin level. That means there is a high concentration of radiation on a single organ — the skin — which was not accounted for in the Johns Hopkins report,” Sedat said. The Johns Hopkins report he’s referring to was done by the Johns Hopkins University Applied Physics Laboratory and published in October 2009. It’s still the leading and most often-cited study concluding that the scanners are medically safe. But there are still plenty of disagreements within the scientific and medical community about the veracity of these claims. And the fact that no biological tests have been performed is certainly disconcerting when you consider that these machines have now been deployed for two years. Personally, as a very frequent air traveler, I ALWAYS opt out of the scanner. Because even if the radiation dose is minute (and that’s IF), I’m not willing to risk my health by exposing my entire body to minute doses on a regular basis. I recommend you read the rest of this article. It helps you understand that you are at the whim of what is around you. The notion that it is all safe, because how would THEY let them do it if it wasn’t. Is as false as false can be. All radiation exposure is cumulative, none of them are safe as they build up in your system and you never know when you have crossed the safe level of exposure, it may be the straw that broke the camels back. Just how much radiation exposure are we getting from Japan? You don’t know and never will. Now add that to the Back Scatter X-ray, your MRIs, your dental x-rays and we have a problem Houston. Thanks Dr E for giving us one more reason to rarely fly. With videoconferencing technology, I almost never travel on business anymore. They’ve been treating us like cattle since 9/11 and sure – I trust the government when they say the scanners are safe – the same govt that pats down little girls and grandmas to prove they aren’t profiling 9 and really looking for terrorists. Since, I’m a guy, I’ll opt for the pat down and request a female screener – might be fun!